Should you replace your floor or restore what is currently installed? If the flooring if a building is visibly dirty or past its prime, this leads tenant and customers to wonder about the cleanliness and upkeep of the rest of the building. 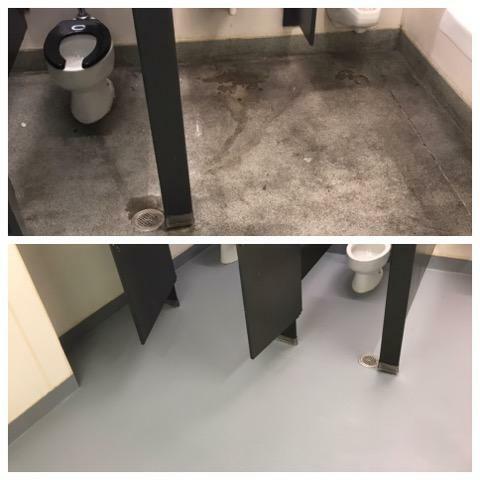 TFM Services provides valuable knowledge of what is and is not possible when it comes to cleaning, repairing, restoring or replacing your flooring system. Our management team has over 100 years of combined knowledge to aid in the decision of how to best remedy your flooring woes. Our team of estimators can establish what process will bring your floor back to life whether that is a restorative deep clean or coating. Or, whether your flooring needs to be replaced and which flooring system best suits your space. Your team will deal with one estimator from TFM from start to finish on resinous flooring/epoxy, concrete polishing, VCT, ceramic tile or LVT. Together, we calibrate expectations vs abilities, decide on new flooring systems, keep the team in the loop during your restoration or install and have a set plan on how to maintain your new flooring after install with TFM Services. TFM Services has set programs to maintain all flooring types which can either be handed off after install or TFM will take on the responsibility of keeping your floors looking new year round. TFM Services truly takes a partnership approach when discussing opportunities with our clientele. Initial efforts by our team are always focused on our customers goals, expectations and reasons for contracting their cleaning services. Ultimately, we know our customer wants a clean office space to spend their time and they do not want to stress over the process to get their space clean. After discussions of the goals of our customer and performance of our crew we can then build a tailored program for our customers staff and building alike. TFM provides porter service during the day for the customer needing a personable and reactionary cleaner on site at all times. First, second and third shift cleaning is always available. On call cleaning services regardless of contractual service is available too! Our office cleaning teams are ready to tackle single occupancy office space up to campus’ with tens of thousands attending everyday. Our goal has always been and remains to provide the highest level of service at a competitive rate. Our management team with over 100 years of combined office cleaning experience is able to calibrate expectation, build a plan and implement that plan with our trained team members. Give us a call at 316-265-5331 or click www.tfmservices.net for a quote! TFM has been a preeminent janitorial service provider in Kansas City for over 20 years. Our team has focused on a floor care niche for most of that time, until the last 5 years. In our time servicing the very demanding retail grocery industry we have learned a tremendous amount about commercial cleaning as a whole. Our price must always be competitive and fair, we must always provide a committed quality service and provide customer service that is unsurpassed. 5 years ago our team decided to diversify our service range to include commercial office space in Kansas City. Immediately, we recognized that our customer service and diligent follow through processes set TFM aside from other facility maintenance providers. Required weekly face to face interaction, required satisfactory signatures, proactive scheduling efforts and diverse service offerings are all standard practice for our team. TFM is excited at the growth we have had in Kansas City over that past two decades. Earlier this year we celebrated the support of our one hundredth building in Kansas City. We accredit our recent surge in growth to immediate customer support, face to face interaction, diligent and diverse service offerings as well as a team that is always looking for a new challenge. We have brought on new management to our Kansas City Team in preparation for continued organic growth and new partnerships alike. Thank you Kansas City! Need support at your facility? 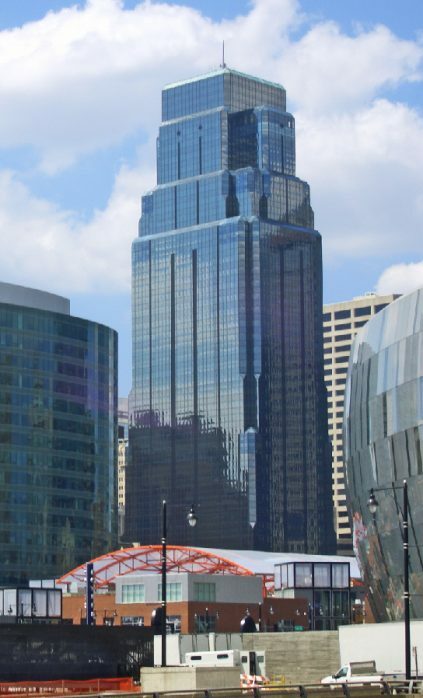 From a small office space one time a week to nightly service at the tallest building in Kansas City and everything in between, TFM Services is ready willing and able to help your team! Give our sales support a call at 316-519-7090 or contact of on our site for a fast, free comprehensive quote! Aerial Cleaning – Detail cleaning the highest of heights! If you don’t know when you last had your facility’s ceiling cleaned off the top of your head, your probably going to have dust falling on your head! Aerial cleaning is a labor intensive job that requires attention to detail for cleaning and safety at all times! TFM has developed our aerial cleaning scope of work and safety program over the course of many years and hundreds of high elevation projects. Cleaning with your feet over 3 feet off the ground? We have a process for that! Cleaning in a single man lift in confined space? We have a process for that! 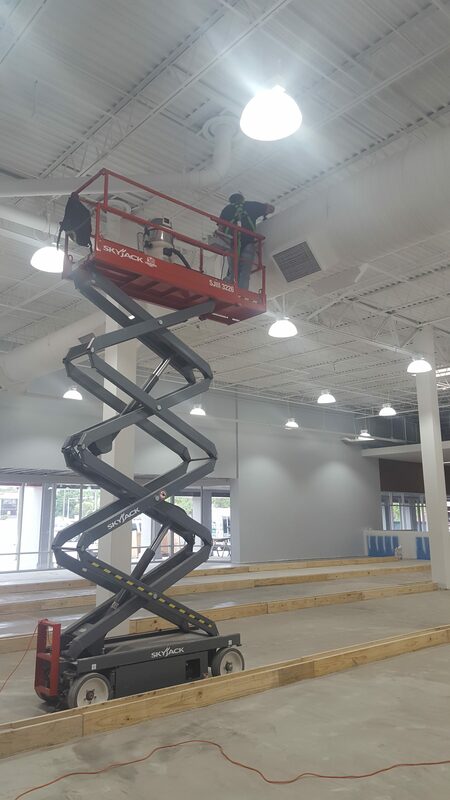 Prepping for paint 40 foot in the air on a scissor lift? We have a process for that! 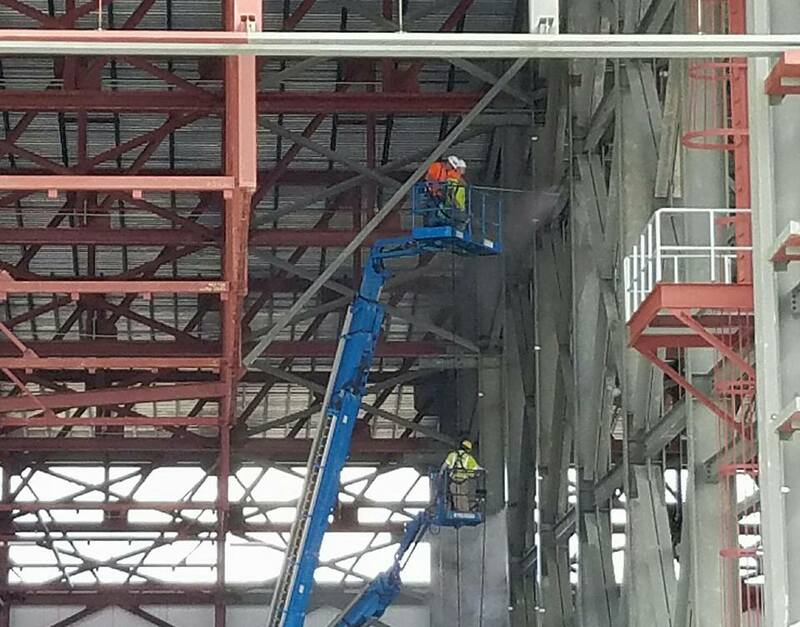 Aerial cleaning an airplane hanger 140 foot off the ground? We have a process for that! 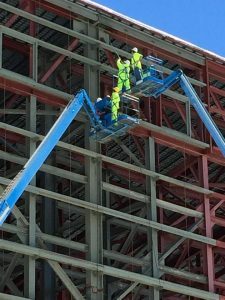 Every team member selected to perform tasks involving elevated work undergo lift certification, fall protection training and safe aerial work practices training. Our teams are accustom to daily AHA (activity hazard analysis) toolbox meetings, working in full tyvek suits, respirators and explosion proof HEPA vacuums when necessary. Whether you have a single day project to remove cobwebs. Or, a several month long project to rid your facility of 60 years of built up aerial debris, TFM has seen it and can support your needs! Call TFM 316-519-7090 or click https://tfmservices.net/contact/ for a free comprehensive quote! Are you feeling the “pressure” to keep your high traffic areas clean and efficient? Then, put the “pressure” on TFM Services! 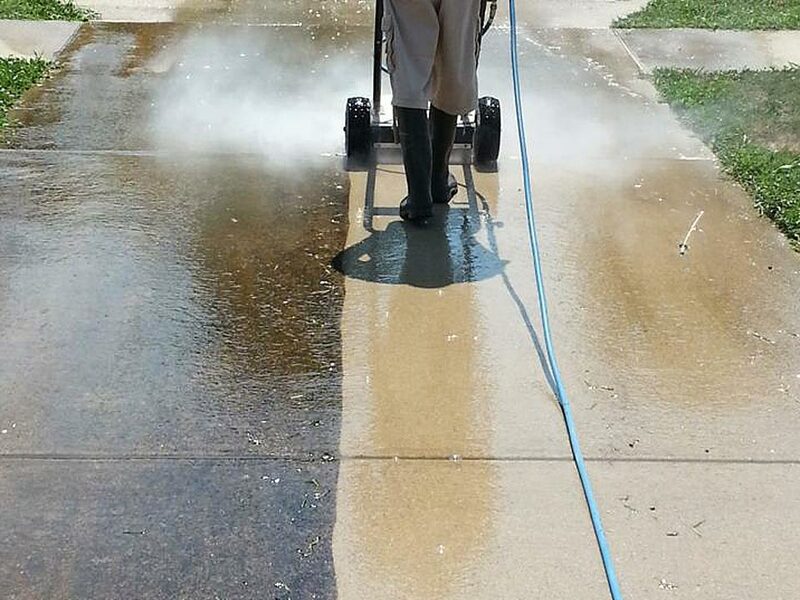 Our pressure washing team is always looking to add happy new clients to our long list of satisfies customers! TFM uses high capacity, truck mounted heated pressure washing systems to tackle your toughest jobs. TFM has been trusted a partner of fueling stations, industrial plants and retail centers for decades when it comes to pressure washing. With that kind of experience you can rely on TFM Services to complete your project on budget and on time. Businesses compete everyday to win their customer satisfaction and garner repeat patrons. The entryway of your building is the first “welcome” your customer receives from your team. Entryways covered in Gum or tar are not only unsightly. They can be a huge inconvenience to the unwitting person who steps in them and tracks it across the building or into their car. Often overlooked entryways need HOT pressure washing to fully remove baked on grime. Cold water pressure washing systems literally cannot “cut it”. Water reclamation is an important piece of the puzzle with pressure washing. Our machines are able to put out 300 to 400 gallons of water an hour! When we are dealing with oils, grease, hazardous chemicals and expensive landscaping it is of the utmost importance that we have a reclamation plan and process in place to ensure none of the contaminates are released with waste water. Give us a call 316-519-7090 or click https://tfmservices.net/contact/ for a free comprehensive quote! In comparison to most other flooring types (i.e. carpet, vinyl composite tile, ceramic tile) polished concrete is a relatively new flooring option. 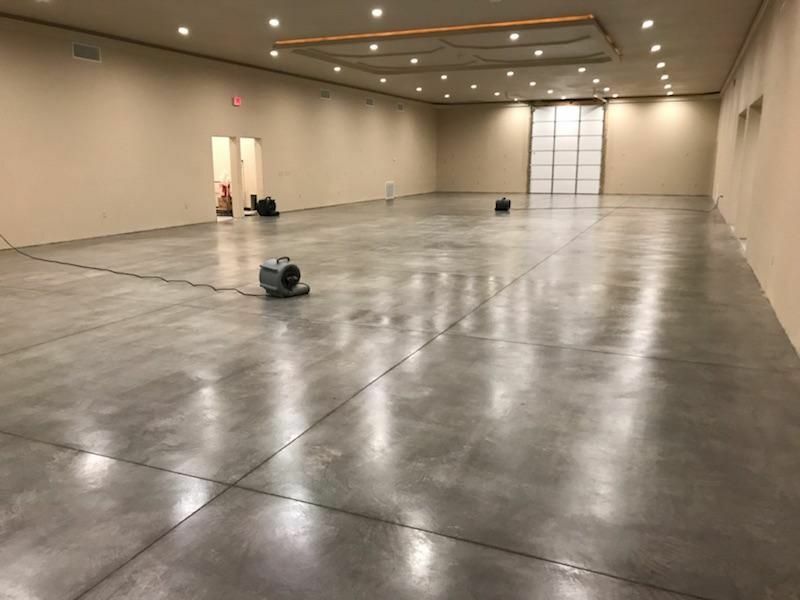 TFM began providing concrete polishing service and concrete stain remediation when we recognized the long term advantages for our customer base with this flooring type. Nearly ten years after our first concrete polishing project, TFM is busier than ever which is a testament to not only our quality of work and process but, the long term cost effective nature of polished concrete. Our team of qualified technicians have seen very uneven slabs, poorly troweled slabs and spawling control joints. If caught before or early in the grinding process these issues can be resolved before they become larger problems. The key with this is to have experience on your side. Estimators, project managers and field technicians that can call out issues if and when they arise. TFM Services supports concrete polishing in Omaha, Lincoln, Kansas City, Wichita, Oklahoma City, Tulsa and nearly everywhere in between. No project is too big or too small. TFM is prepared to mobilize to your single office space clear up to warehouses that are hundreds of thousands of square feet. If you are looking for a cost effective install, low maintenance flooring option with great aesthetics, polished concrete by TFM is for you. Call 316-519-7090 or click www.tfmservices.net for your free comprehensive quote. TFM was very happy to have the opportunity to help The Venue in Arkansas City. Their family owned and operated business has a great story of how they came to be and where they want to go in the future. We sent three of our best team members down to get their floor turned from a construction zone to a dance floor in one night! We look forward to working with them in the future! 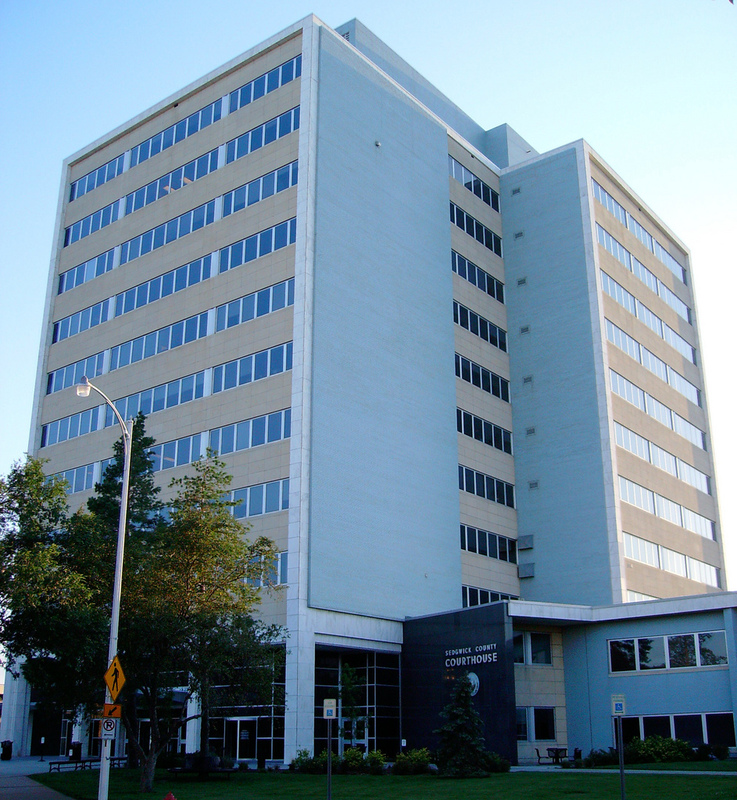 Similar to this building, TFM has been providing facilities maintenance and support to customers large and small all across the Midwest for three decades. While our customer base has grown to include many fortune 500 clients and thousands of properties we pride ourselves on being able to stay focused on each and every job no matter how big or small. TFM has gathered dozens of experienced technicians specializing in a vast array of facility services. Whether your needing floor care, janitorial, concrete polishing, pressure washing, aerial cleaning, plumbing , electrical or HVAC maintenance TFM has you covered! Aerial Cleaning / Pressure washing at its finest! Flashback to about a year ago when we cleaned thousands of steal beams nearly 140 feet off the ground! Our customer had the framework of their building erected with mud and concrete stuck to the steal. The beams needed to be perfectly clean prior to painting! 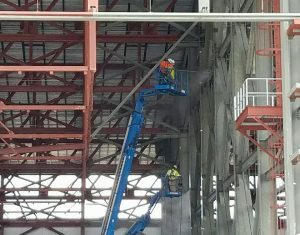 TFM organized and mobilized two 135′ boom lifts, two heated pressure washers and 5 trained individuals to pressure wash thousands of dirty beams for nearly an entire month! 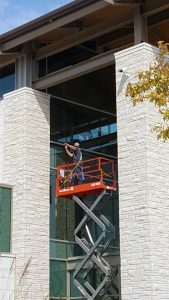 Their were many challenges including anchoring enough pressure washer line to reach 140 foot into the air, working around other trades whom were also on tight deadlines, keeping our vast work space tidy to allow other trade work to be performed and keeping our equipment performing in optimal conditions. Battling finicky machines, long hours, dangerous heights and high winds TFM worked safely and completed our tasks ahead of schedule! Good Work Team!